Tables are often used to layout and summarize data. But have you been in a situation where the table got so big that it is not easy to read? The table is so big that it is hard to tell which rows and columns a certain cells belong. For example, in the table below, it is hard to tell which row the “Y”‘s are starting from the 3rd row. As a table gets bigger, it is easier to confuse which row or column each cell belongs to. Alternating bands of colors can make a table more intuitive and easy to read. The “Y”‘s closer to the middle is especially hard to tell which row it belongs to. To make things more intuitive, you can use alternate shades on each row or column on the table using conditional formatting. Below is a formula that returns true for each odd row. 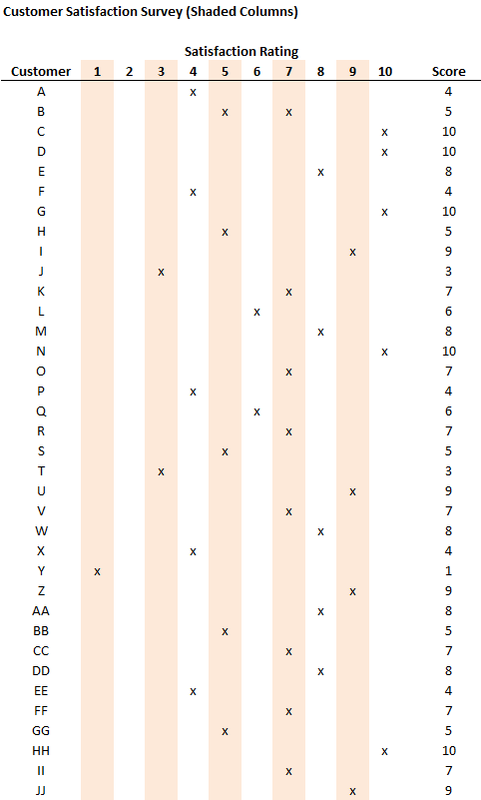 In this example, data is laid out in a long table, making the 3 to 7’s hard to read. The alternating column colors make reading the table much more intuitive. When a table has many rows, it’s hard to figure out which column the data is in, especially ones in the middle of the table. Coloring every other column makes the table much more intuitive to read. For a long table with a lot of columns, always make it easier for the reader by using conditional formatting on the columns. Instead of shading the intersecting cell white, a 3rd color can be used instead. In this case, blue. This entry was posted in Excel, Excel 2003, Excel 2007, Excel 2010, Work Smart and tagged Formatting. The checker pattern dosen’t work??? ?